Nearly 1.7 million T-Mobile USA subscribers are affected by a service disruption that hit the mobile operator beginning late Tuesday afternoon. "At this time, approximately 5 percent of T-Mobile customers are experiencing service disruptions," the company said in a statement, adding that voice and some data services are affected by the disruption which began at 5:30 p.m., Eastern time. "Our rapid response team is working continuously to fully resolve this disruption," it said, without offering an estimate for when service will be restored or a reason for the disruption. T-Mobile had 33.5 million subscribers at the end of the second quarter. Based on that figure, 1.68 million users are affected by the outage. 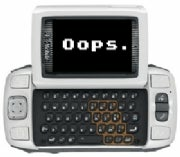 T-Mobile suffered an embarassing mishap last month, when thousands of Sidekick owners lost data due to a server crash at Danger, a Microsoft subsidiary that provided service for that segment of T-Mobile. Much of the data was later recovered.